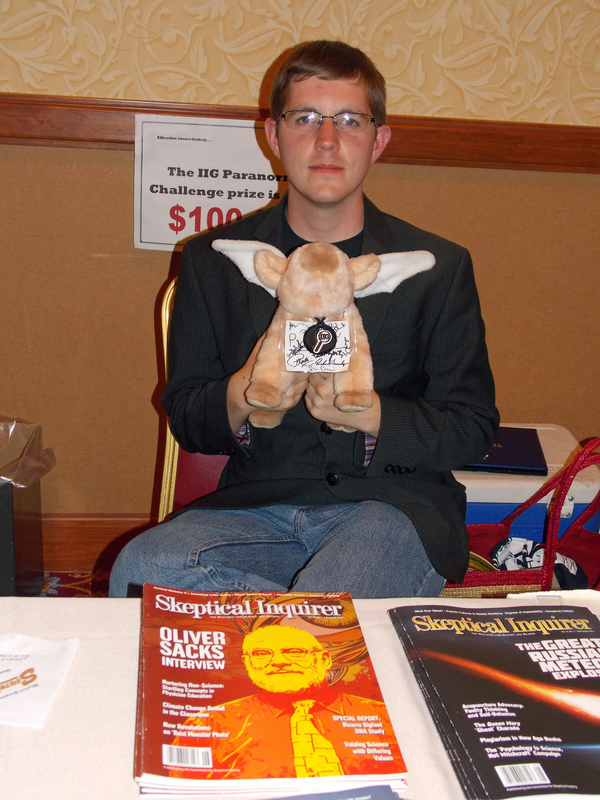 I’m back from TAM 2013, and have to rate it as one of the best TAM’s ever. Many attendees have remarked it reminded them of earlier TAM’s, a relaxed comfortable time with many newer voices being featured. 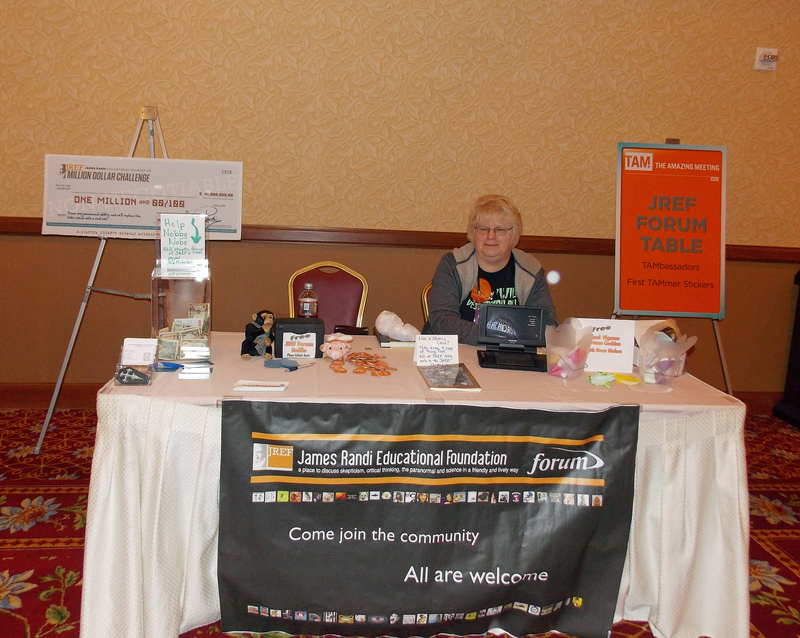 I had a great time with my friend Natalie, who is the heart and soul of the Forum Welcome Table. This year we gave out skeptic necco wafers and origami fortune cookies. Natalie made origami pigasus for all, and we had a raffle for a fun stuffed flying pig. We answered questions galore, and met lots of new friends. Our goal of lots of free stuff, and friendly information, was met. My friend from Granite State Skeptics, Andrew Hansford, gave a great paper presentation on Sunday morning. He’s promised to write a blog post about his paper to share here on Yankeeskeptic. I was also Andrew’s date for the speakers reception, where I got to eat free food and chat up with the wonderful Susan Haack. I not only enjoyed her talk, I got to enjoy one on one conversation with her. She has a wonderful sense of humor. Speaking of Andrew, the reason there is not photograph of Bigfoot (despite everyone having a camera) must be the same reason there is no photograph of me wearing my pajamas and with curlers in my hair while attending Andrew’s early morning Sunday paper presentation. I thought it a terrific joke to show up in this outfit. Other people thought “Oh the dementia has set in early” and kept asking me in the most gentle way possible if I knew I still had curlers in my hair. Yes, I did know. The sad part is that the non skeptics staying at South Point that shared an elevator with me earlier got that it was A JOKE. The skeptic critical thinkers were a little slow on the figuring out the joke. Caroline Gayle, how does she do it? My friend Noah Whippie came, and was welcomed by all to his first TAM. DJ Grothe and the TAM team made sure Noah had a seat in the front row because of his eyesight problems. More than once the team went out of their way to make sure he had everything he needed to make sure his TAM experience was the same as any full sighted person. I have to thank the JREF for being proactive in this. It’s love! Our family owes this man so much. He has indeed been a wonderful friend. I usually have a problem picking the best moment of TAM. That should have been a problem this TAM, but Randi made it easy for me. 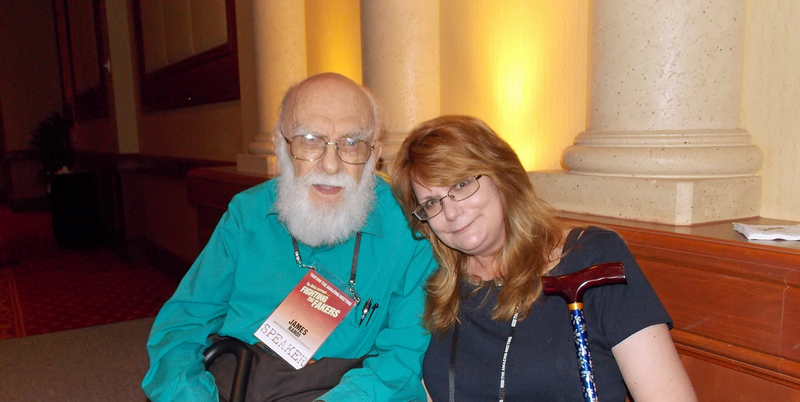 His keynote address this year was typical Randi. He thanked his friends. His friendships with the famous are well known, lesser known is how he has reached out over the years to help so many people that have just crossed his path. He thanked the wonderful Scott Romanowski, who has attended every TAM and been in charge of the volunteers each year. He rightly credited Scott with making TAM a success. Then as I am just sitting there, Randi calls out my name. I teared up, touched he would remember “just a friend” in this gathering of so many. I stood and waved, and he mentioned my children’s book. 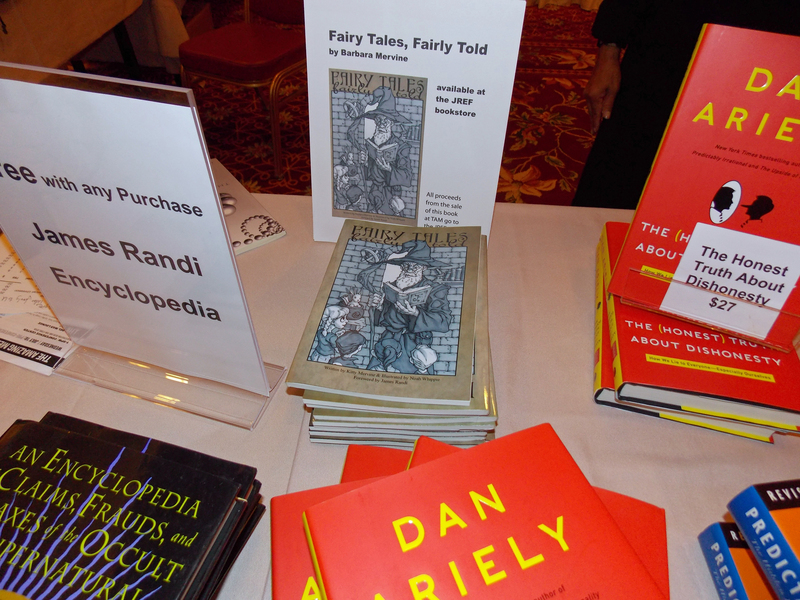 The book promptly sold out from the JREF bookstore table after Randi’s recommendation. Randi truly treasures all his friends. His keynote, filled with the names of just “everyday skeptics” and friends, showed how he recognizes it’s the people that attend TAM that make skepticism work. It’s all the little things each of us do everyday that helps promote critical thinking worldwide. It’s not just the Dawkins and the Randi’s, it’s the Scott’s and the Barbara’s that also keep this movement alive. Two books here you should buy! Thank you Randi. I will treasure the gift of that moment forever. I got to spend time with so many skeptic friends. Randi told me about his partner Deyvi’s newest artwork. The pride in Randi’s voice made me smile. Love is a wonderful thing, though I will say Deyvi’s artwork is well worth being proud of. Susan Gerbic was there, tirelessly promoting all her projects, and she was honored with the Randi prize. Her work is well worth supporting and she deserves her own blog post here. My admiration for her comes from her working to spread the critical thinking to the masses. She is not preaching to the choir, but to the fence sitter or the uneducated on a subject. Keeping wikipedia honest is just one of her many good projects. She has a full time job also. She truly is an inspiration to us all. I should include her son, Sterling, as one of her most successful projects. He’s an incredible young man I’ve been proud to know for many years. I got to see Todd Robbins eat a lightbulb in real life. I’ve only see him eat one on television. He actually seemed to enjoy it and shared he’s eaten over 4,000. He’s a real life inspiration for my daughter, who can now walk on glass and is also a block head. I blame Todd for all of this, along with thanking him for making sure my daughter Aynsley is never boring. Natalie is like a sister. I see her as often as we can get together, so being with her at TAM was just like having family there. Robert Sheaffer, one of the foremost UFO experts in the world, honored me by treating me as an equal. I hope that starting this blog, and really doing some hard work investigating UFOs and aliens over the past year, convinced him I’m worthy of his time! 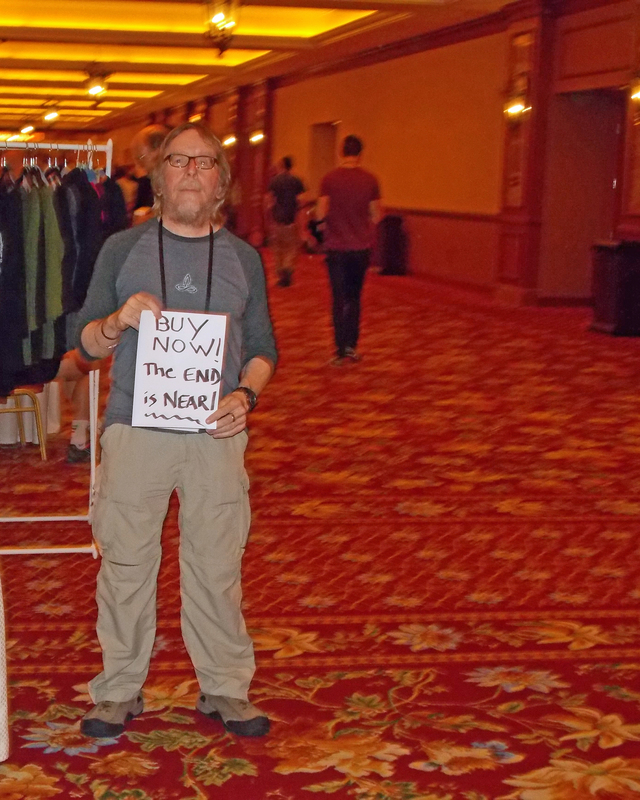 He gave me some great advice for attending my first BIG UFO conference this Fall. It is wonderful to know I can count on his good, if sometimes distressingly honest, advice whenever I need it. I also am glad of the chance to help him. We’re all on the same team, truth. Sharon Hill did moderation, a talk, and was on a panel. 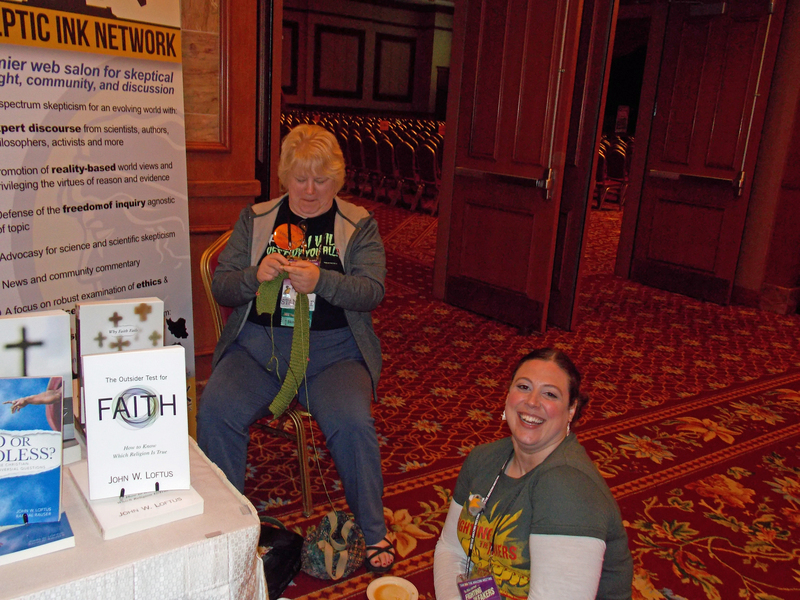 The hardworking skeptic women I met at TAM will inspire me all year. TAM also had a large percentage of women speakers. If any skeptic conference has trouble finding enough women to speak, just consider the women that spoke at this TAM. I could go on and on. My friend Caroline Gayle and Jonny Zavant performed (hire them, the audience almost couldn’t breath they were laughing so hard) “How does she do it?” Only Caroline knows. Ethan Brown did his magic square and made an entire audience of smart skeptics feel DUMB. BJ Kramer gets thanks for having enough bacon at the Bacon and Donut party. However, his head it big enough without me telling him how fantastic it is having him as a friend. He’s truly a “good guy”. Period. Yes I bought a few books and other skeptic items from vendors. Alright,a LOT. The Granite State Skeptics gang was all there, Dale, Travis, Nathan, Steve and Andrew. We need another GSS member to give a Sunday paper next year! Small state with skeptics doing great work! I’m proud to belong to such a great skeptic group. I know I’m leaving out too many people, but this TAM was a wonderful almost drama free time. I’m already thinking of how to make next year’s welcome table even better, and I am working on two new skeptic children’s books. TAM is all about inspiration! 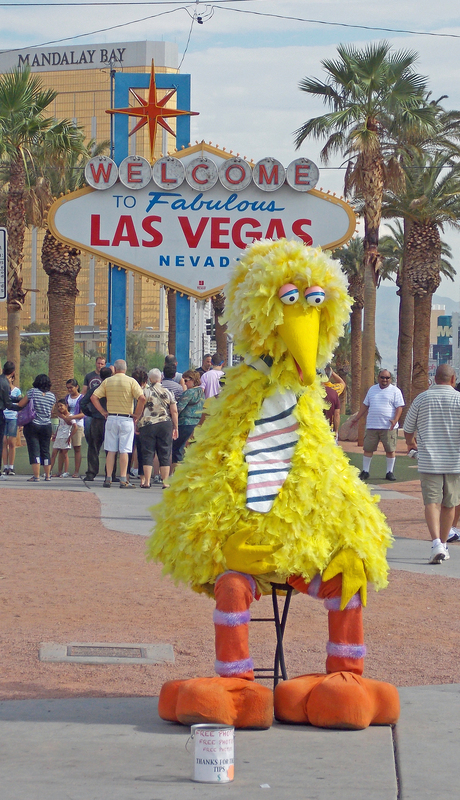 Bigbird should have gone to TAM. He would be happier. « Luciana, don’t read this blog post! One day I will get to TAM….. I really hope! I hope that I can give a paper next year. Professor Hall didn’t accept mine this year. Besides, i need a new topic for the Skepticamp this year. You would be great, as you are a good speaker. I should suggest to Dr.Hall they put you FIRST as you would make sure everyone was awake! Thanks again Kitty, don’t know why you give me so many kudos when you inspire me! If I’m feeling blue, I know a quick chat with you will always cheer me up. As far as my many projects, I have many more in store and come back from TAM with batteries charged. We have a ton of work to do, rewriting Wikipedia is a daunting task, but its important work. I loved your book BTW and everyone should get several for all the children in your lives. Noah’s illustrations by themselves are a wonder. not sure how to do that Susan! (Lanyard). Anyway, I’m so happy to get that TAM recharge. When you see what a wonderful cause critical thinking is, and you feel inspired by so many… you come home ready to work! It’s hilarious how many projects I’ve come home with! And wonderful.